In Buddhism, the tradition of chanting is a method for preparing the mind to meditate. A few months back we toured The Tooth Relic Temple and Museum in Singapore and as we heard this chanting in the background we gathered around our tour guide. 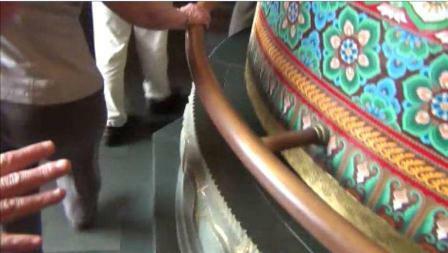 “Now we are going to walk now into the hall of the creator of my future The Buddha,” she said. I thought that her words were such a fascinating way to explain a power greater than ourselves. In our Executive MBA program, the concept of consilience is brought up often. One of my professors explains it as different ideas jumping around together to form a comprehensive theory based on facts. This concept demonstrates there are multiple ways to come to the same answer and as leaders we strive for consilient thinking. It isn’t about being right or wrong, but rather being open to possibilities because often, there are many. In Taoism the word “way,” also means path or principle. The belief is “the way is not the true way” which is the idea that we don’t need to search outside of ourselves for truth or meaning because it is right in front of us and within us. It always has been.